Sibiu is also known as Hermannstadt (the German name) as it is the most important center of the German community in Romania. The German legacy is still present nowadays in every corner and aspect of Sibiu’s culture, history and people. 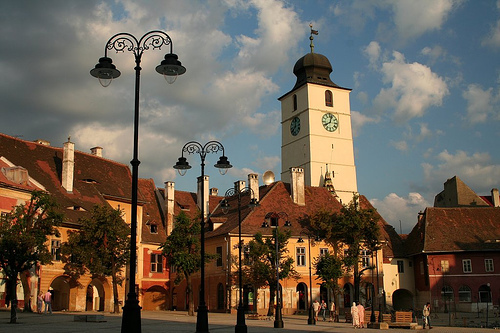 Sibiu has a charm of its own, exquisitely blending old and new, history and present, nature and civilization. Not only is Sibiu the Saxon pearl of Transylvania, it is also one of the most beautiful cities in Romania. The city was also the cultural capital of Europe in 2008 and was completely worthy of the title because of the numerous and prestigious events organized in the city every year from concerts and festivals to balls and many other events. The fortresses and castles of Transylvania date back to the 12th century, when the Hungarian kings brought on the Romanian territory migrants (known as Saxons, of German origin). They were offered a lot of rights and privileges in order to protect the territory against the attacks of the Tartars and Turks. The Saxons set up what was known as the ‘the land of the 7 fortresses’, that is 7 fortified cities as well as numerous villages to protect the population in case of attack. Sibiu was one of the most important of these and it gradually developed into one of Romania’s most admired and beloved cities. – The Brukenthal National Museum is the 1st museum opened in Romania in 1817 and nowadays is one of the largest museums in South-East Europe. 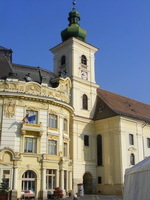 Samuel von Brukenthal was Transylvania’s governor and as such he had a palace built in late Baroque style and situated in the Large Square (‘Piata Mare’). 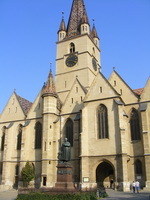 – The Evangelic Church is one of the most impressive buildings in Sibiu, mainly due to the dominating tower that is the highest one in Transylvania. Needless to say that the view from the top is breathtaking, not to mention that if you happen to be there when the bells start to ring the overall feeling is not to be forgotten too soon. – The National Museum Complex Astra, a wonderful open air museum, is situated in the Dumbrava Sibiului Forest, only 4 km far from Sibiu. You are invited to a nice, relaxing walk across the forest, admiring old rural households and traditional craftsmanship. – The Bridge of Lies is an emblematic sight for Sibiu, situated near the Large Square. Though it is not impressive by height or length, the bridge is nevertheless the first forged iron one in Romania. Since Sibiu was one of the 7 Saxon fortresses and the buildings and fortifications have been preserved extremely well, above the well-known sights already mentioned, Sibiu also means going back in time. A walk through the narrow streets, bordered by old buildings is sure to take your mind off your stressed, mundane life. Don’t wait too much. This Saxon city in Transylvania has many more hidden beauties for you to discover!